One of my favourite family traditions for Christmas is making a handmade ornament with the kids to add to our tree. 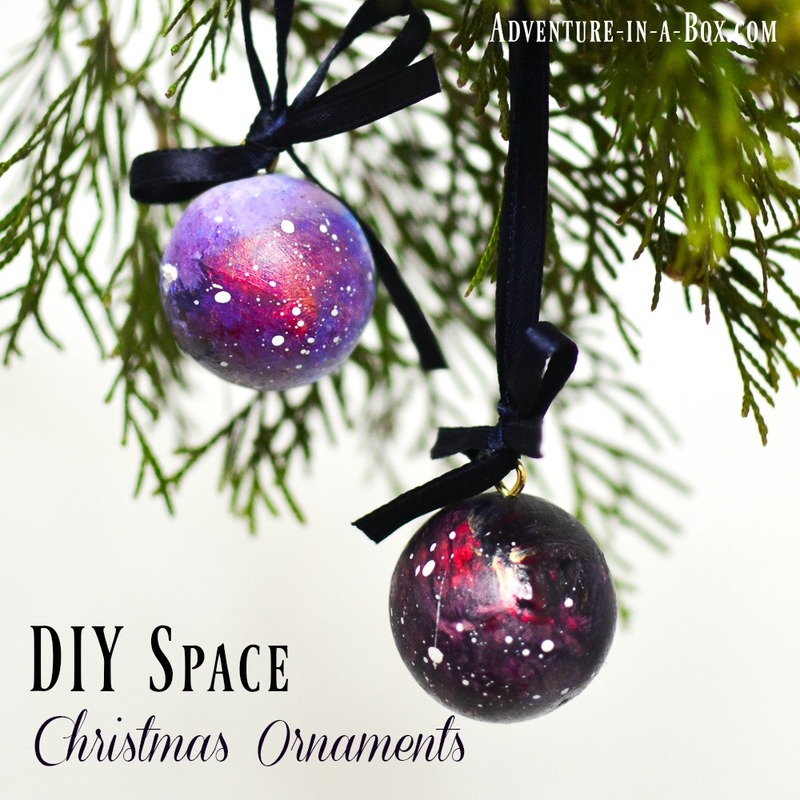 This year’s craft is space ornaments with swirling nebulae and twinkling stars! 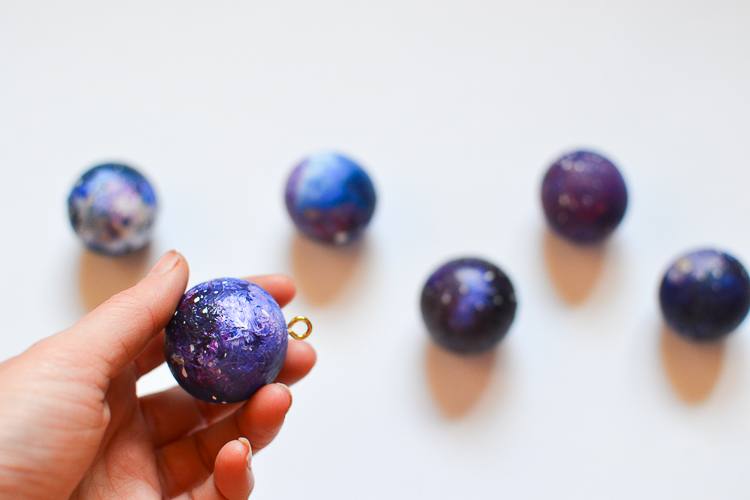 If our handmade ornament is supposed to represent the year, the space ornaments are perfect for this one. 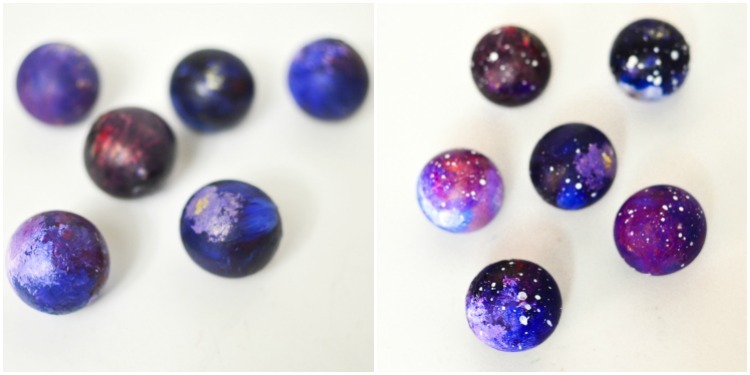 Anselm has drawn hundreds of spaceships and created a lot of little fantasies that took place in space, so he felt really pleased to make his own little ball nebulae. Half of the balls were made by me, and the other half by Anselm, who is about to turn four. So it’s a really simple craft that can be equally enjoyed by adults and kids, inspired by the beauty of galaxies far away. 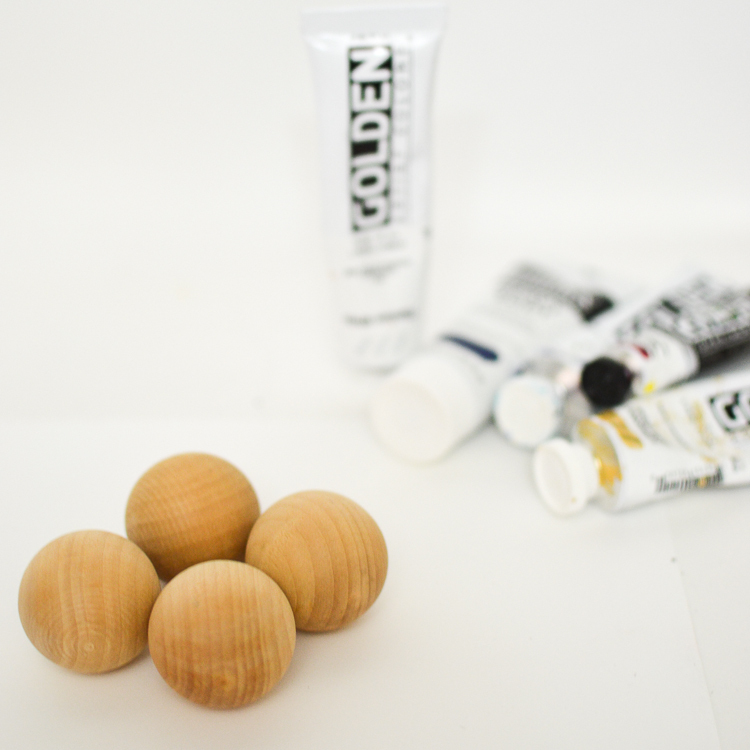 Balls: We chose 1 1/2″ wooden balls that were left-over from Anselm’s games in toddler-hood, but you can also do wooden knobs or choose styrofoam balls. From my experience, clear plastic or glass ornament blanks would be a little too smooth for good paint adhesion. 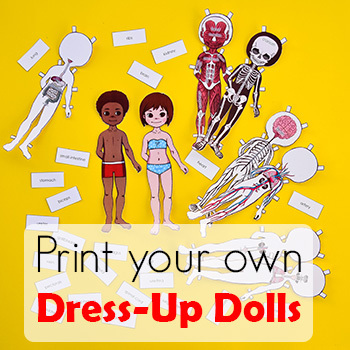 If you do opt for plastic, it may be a good idea to prime them with spray paint. Acrylic paints: Heavy acrylics are my favourite for providing good coverage. Craft acrylics may require a couple of layers. We used navy blue, ultramarine blue, magenta, white and golden. Golden is optional but it did add beautiful streaks. 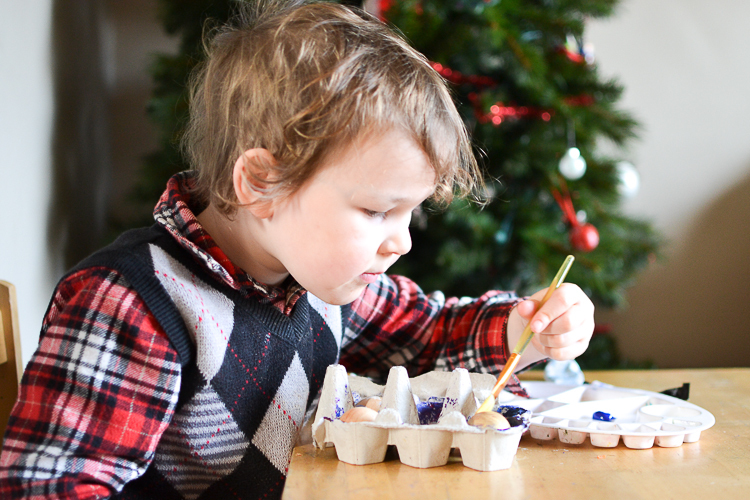 Eye hooks: They will be necessary if you start with wooden or Styrofoam balls, like we did. 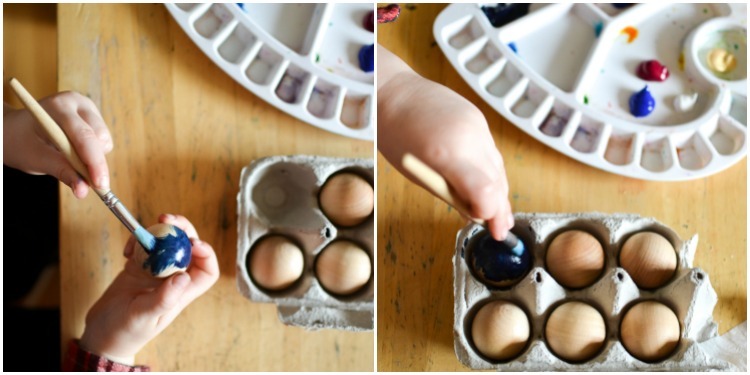 It’s not easy to paint the balls without getting dirty, so our trick was to use an empty egg carton. It held the balls in place and didn’t let them roll around while we were painting one side. Then we let them dry and painted the other side. When painting wood, I preferred dabbing with the brush to create a mottled texture. A foam brush would work well for that technique. I mixed paints without adding any water, and that created a thick layer with different shades of blue and purple. For nebulae, I added just a little white and a tiny bit of golden. But then, look at Anselm painting! He didn’t use any particular techniques. And in the end, our space ornaments were pretty much indistinguishable. 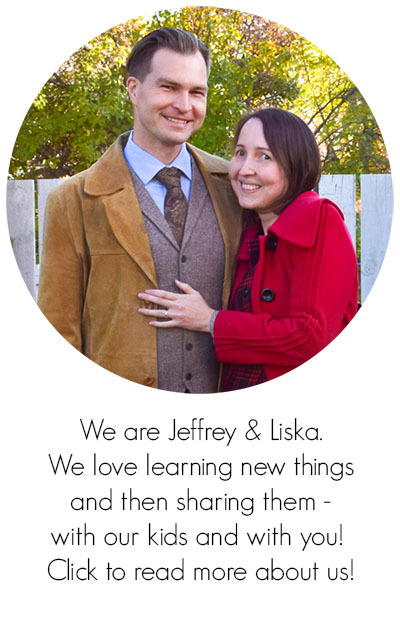 At least, I’d have to think hard to remember who made which one of them. After both of the sides were painted and dried, we thinned out some white paint with approximately twice as much water. Then we dipped the brush in the thin paint and flicked it on the balls. The tiny drops of diluted white created a suitable starry effect. After that, we needed to find a way to hang the balls. I drilled tiny pilot holes and inserted eye hooks into them. 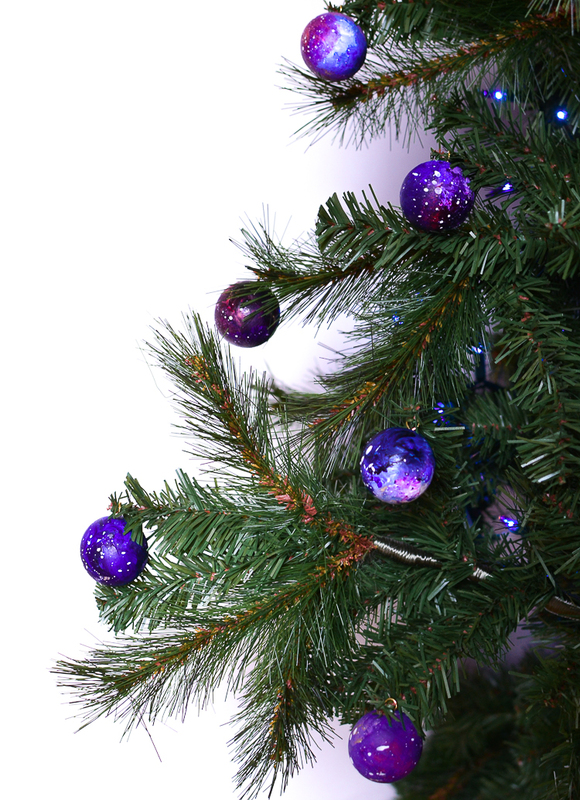 If you have Styrofoam balls or knobs, drilling can be omitted, and if you had ornament blanks ready to decorate, this step can be skipped altogether. And the ornaments are ready. 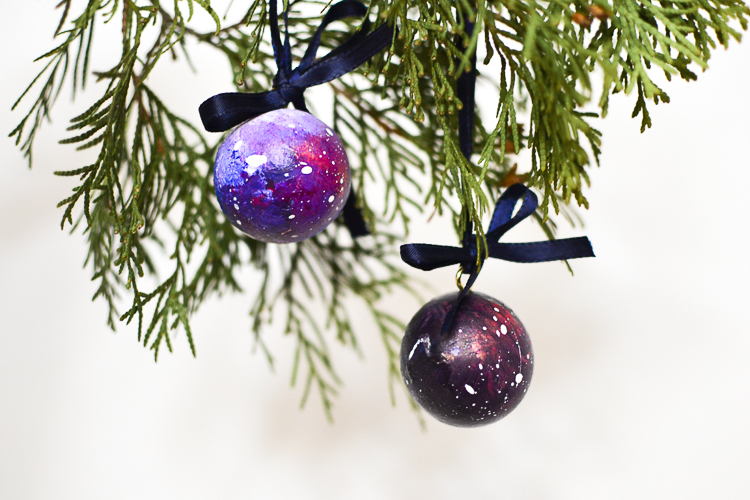 Tie with a string or a bow and hang on the Christmas tree or pack a few as gifts! 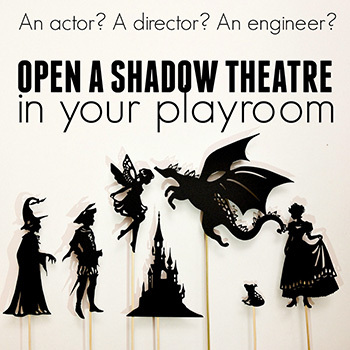 We’re always excited to see photos of crafts based on our tutorials and to hear your feedback! 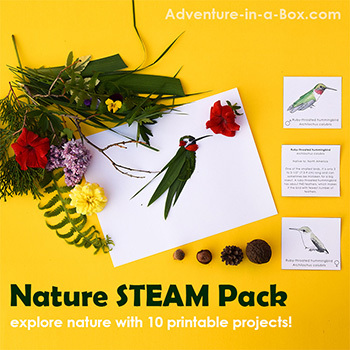 You can post them on our Facebook page, email me or tag us on Facebook or Instagram – @adventureinabox.